Growing Cranberries – how this well-known “holiday” super-fruit makes it to the dinner table. Cranberries have long been a traditional part of many Thanksgiving and Christmas dinners. Families all seem to have their own way to enjoy them, whether it’s in the form of cranberry sauce, cranberry relish, or a dish of fresh whole-cooked cranberries. Cranberries are actually quite the super-fruit when it comes to healthy eating. Cranberry sauce all ready for a little Thanksgiving Turkey! They can be beneficial for fighting and controlling urinary tract infections. They are also linked to helping lower blood pressure and improving the immune system as well. But what really makes cranberries a unique fruit is how they are grown. In fact, growing cranberries, as well as harvesting them, is an interesting process that can only happen in areas where the soil and temperature cooperate. Cranberry plants are woody, shrubby-style vines that grow low to the ground. They are a perennial plant, and can survive and produce for decades on end if properly cared for. But they do require some special conditions to survive and produce. First, they need to be grown in a soil medium with a lower PH of around 5. This is most often found in peat-filled or sandy type soils. It takes special soil and temperature requirements when growing cranberries. Cranberries also need to be planted in an area that has enough cold weather to force the plants into a required dormancy phase. The dormancy phase allows the plants to prepare to set fruit for the following season. For cranberries, it means at least 3 months with temperatures in the low 30’s. These two requirements are exactly why the Northeastern and Northwestern sections of the United States are perfect for growing cranberries. The glaciers that hit this area thousands of years ago created hundreds of small pockets and depressions that became the perfect home for cranberry plants. As the depressions filled with plant material that then decayed, natural bogs formed with the perfect peat and sandy-type soil needed for growing cranberries. These “bogs” formed along the upper northeast in Massachusetts, Maine and Connecticut, and down and across as far as Michigan, Wisconsin and New Jersey. Cranberries also grow well in the upper northwest in states like Oregon and Washington. It is here where the same favorable temperature and soil requirements are met like in the Northeast. Of all states, Massachusetts leads the way and accounts for nearly 25% of all cranberry production in the U.S. So just how are they grown and harvested? Cranberries flower and bloom in late June or early July. It is then after pollination that small berries begin to form on the vines. In the United States, the berries are ready to harvest anywhere from late September to Mid-November. 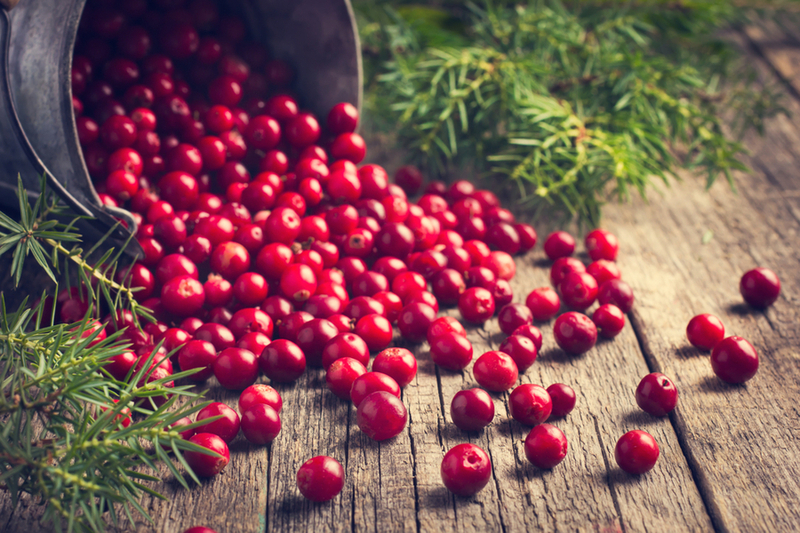 Although many instantly think that cranberries are harvested in water – they are actually harvested dry as well. Each method serves a specific purpose. Cranberries being harvested in a bog. For a wet harvest, the bogs and low-lying cranberry fields are flooded. Then a special machine nicknamed an “egg-beater” rolls through with paddles to knock the berries from the vines. Because cranberries have small areas or pockets of air under their skin, they float. So once they are dislodged from the vines, they can be herded up on top of the water, and then sucked into bins. A dry harvest can be done of course by hand, but in today’s world, it most often performed by mechanical means. A harvester rolls through the fields plucking the fresh berries from the vines. In order for a dry harvest to be successful, the vines must be completely dry. If not, the berries can be ruined during the harvest process. The dry harvest is used for the “fresh” portion of berries that you find in small plastic bags in the grocery stores around Thanksgiving. The wet harvest berries are used to make everything else – from juice, to cranberry sauce and more. So here’s to knowing a little more about those cranberries on your dinner table this Thanksgiving or Christmas! Starting Seeds Indoors – 5 Big Tips To Grow Your Own Plants This Year! December 26, 2018 TIMG Comments Off on Starting Seeds Indoors – 5 Big Tips To Grow Your Own Plants This Year!